Whether you want to stroll through the colorful Wernigerode old town, or rather go on a discovery tour in the forest - from our holiday homes both are possible in just 10 minutes. But also, if you just want to relax and escape the stress of everyday life comes here at his expense. Despite the proximity to the city, our Harz houses are located in a quiet location on the edge of the forest of Wernigerode and invite you to linger in every season. Enjoy the first rays of sunshine on our spacious terrace with a nice cup of coffee or make yourself comfortable on colder days on the large corner sofa in front of the panoramic window. The 2018 newly built cottages were furnished high quality and with great attention to detail. Despite the modern design, they do not lack comfort and coziness. With its 85 square meters each house offers enough space for a relaxing holiday. All 3 cottages are designed for 4 people each. They are at ground level and have a modern bathroom with shower, and 2 separate bedrooms, each with a large double bed. The light-flooded open kitchen is fully equipped and allows you to cook at home. The loft-like living and dining area invites you to cozy cooking evenings. If you prefer to enjoy the evening sun with a relaxed barbecue, you will get your money's worth on the adjoining terrace with electric grill. For your entertainment you have a large flat screen with Smart TV, a radio and free Wi-Fi available. You can store your bicycles in a separate bike room with a bicycle suspension, where you can also load your e-bike. Parking is available in front of the house. On request, we are happy to provide a cot and a high chair for the younger guests. Spend the best time of the year in an environment where you feel comfortable! The HarzHäuser are close to nature in a quiet residential area on the forest and outskirts of Wernigerode and are an ideal starting point for excursions in the varied Harz. The city center is within walking distance in just 10 minutes, various bakers, supermarkets and a bus stop are nearby. A large adventure pool is just 2 km away and offers a large spa area with a sauna area, an indoor play area and a sports bar with a bowling alley. A trip on the Brockenbahn to the highest mountain in Northern Germany, a visit to the Wernigerode castle and a visit to the aviation museum are also worthwhile and are also within walking distance of our holiday homes. The bathroom consists of a double vanity, a shower, a toilet and plenty of storage space. Uns haben die 4 Tage sehr gefallen. Die Wohnung ist wirklich mit ALLEM ausgestattet, was man braucht. Es fehlt an nichts! Es passt alles wunderbar zusammen. Man fühlt sich sehr wohl. Die Lage der Wohnung ist prima, zur Selbstverpflegung ist ein Supermarkt ganz in der Nähe und viele Ausflugsziele sind gut zu erreichen. Eine sehr schön eingerichtete Ferienwohnung. Es fehlte uns an nichts und die Vermieter waren außerordentlich nett und zuvorkommend. Super schönes Ferienhaus in ruhiger Umgebung - Ideal für einen Familienurlaub. 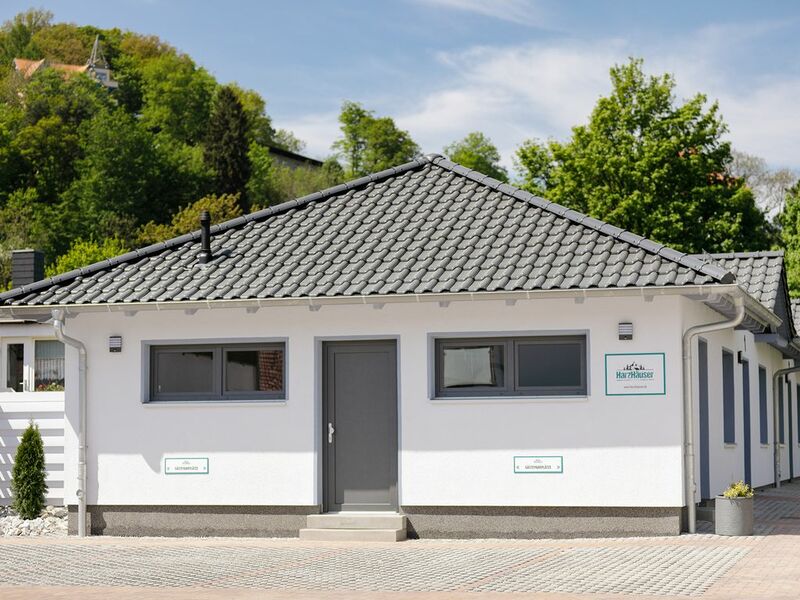 Ein wunderschöner Bungalow, sehr ruhig gelegen, man hört keinen Verkehrslärm. Bis Zentrum ca. 800 m, leicht zu erreichen. Der Bungalow war wunderschön weihnachtlich gestaltet, sogar kleiner Weihnachtsbaum war vorhanden, ein Traum... schönste Unterkunft ever, und wir reisen viel! Ein sehr schönes Haus, leider waren die Betten so hart, dass wir auf dem Sofa schlafen mussten. Im Bad fehlte ein Schminkspiegel und ein Plissee für das Fenster, man konnte im dunkeln ins Bad schauen, trotz Milchglas. Aus diesem Grund werden die Plissee´s in dieser Woche noch montiert!